The update channel provides control over which updated you are notified about and are installed upon request by the Automatic Updater. Navigate to Utilities > Update WHMCS. 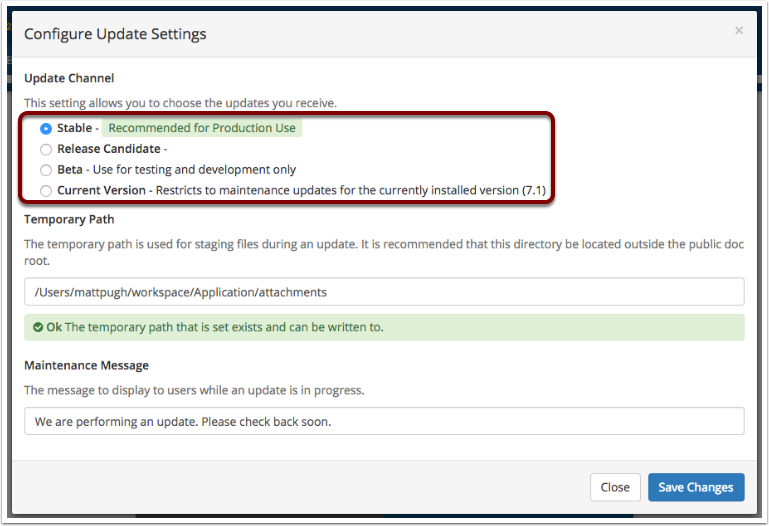 Select the Configure Update Settings located towards the top right of the page. Choose your desired Update Channel. For most users, we recommend choosing the Stable channel which will only apply Stable updates to your installation. Recommended for most installations of WHMCS, the Stable channel will track the latest stable version that has been released. The Release Candidate channel will allow you to receive releases after beta testing but before they are released to the Stable tier. The Beta release channel will allow you to receive the very latest versions of WHMCS. This tier should only be selected for development and test based installations. This channel will restrict you to only receiving maintenance updates for the major/minor version that is currently installed. For example if the installed version of WHMCS is 7.0.0-GA, admins will be offered upgrades to 7.0.1-GA and 7.0.2-GA, but not 7.1.0.